Enjoy the fruits of your labor with a side of chips or a freshly prepared taco. Offering all the seeds, starter soil, and planters to get you started, this grow kit is filled with fixins for a flavorful salsa. 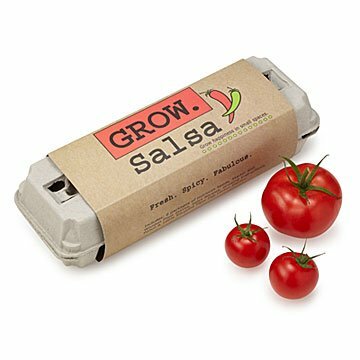 Six seed packets for Roma tomatoes, jalapeños, verde tomatillos, cilantro, scallions, and beefsteak tomatoes get their tasty starts in the included recycled egg carton. Use the plant stakes, growing instructions, and pencil to nurture and track their growth. Once the seedlings have outgrown their first home, transfer them to a larger planter and let the fiesta begin. Assembled in Covington, Georgia with all materials sourced throughout the USA. For a complete happy hour harvest, check out our Cocktail and Pizza Grow Kits. Kit includes roma tomatoes, jalapenos, cilantro, verde tomatillos, scallions, beefsteak tomatoes and salsa recipes. I gave this as a gift and it was a huge hit. It's unique and useful, great for someone who likes plants and food. Cute & original gift for parents & anyone else! Bought this as a gift for my brother. His family has a small garden that they plant with their toddler, who loves gardening. This was a cute and practical gift the parents can share with her. They really enjoyed it when they opened the gift. Great packaging .... fun product. I would buy the product again! I am looking forward for the competition! Very easy to use! We grew a ton of plants. We made 3-4 batches of salsa! So far three of the four ones I've planted have sprouted. I'm excited to plant them in a bigger space soon and harvest my own tomatoes and salsa ingredients. I will plant the other items eventually and hope they all sprout. Disappointed that the jalapeno didn't sprout, but I did buy it mainly for cilantro, so wasn't too bummed. Seedlings are starting to grow, looks easy enough to set up and plant (although I have given these as gifts, so I have no experience). It's a simple yet unique and gives you everything you need in the package. It also comes with detailed step by step instructions. This makes the planting process very quick and easy. We can't wait to see what grows and try out the homemade salsa! It's a great product! No complaints so far. Enjoy the fruits of your labor with this simple grow kit, offering seeds for all the fixins for a flavorful salsa.